This home owner desired to turn their small kitchen into a spacious great room with a craftsman cabinet design, plenty of kitchen storage and beautiful ocean views. Our team came up with a kitchen design that laid out a perfect solution for our home owner to review so they could move forward with the confidence of knowing exactly what the end product would be. First, it was necessary to remove an existing cabinet space to open a dramatic view to the ocean. 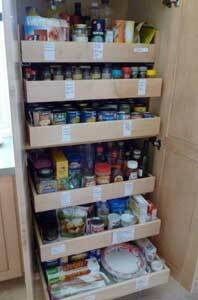 We regained that storage space by converting one kitchen corner into an area for a Lazy Susan cabinet. We then custom crafted the second corner with a hidden cabinet door which can be used for kitchen supplies or as a liquor cabinet. The home owner enjoyed dinner parties setting her table with oversized plates. Knowing this we custom crafted upper cabinets to be 13 inches deep vs. the standard 12 inches to accommodate her dinnerware. This is an excellent example of how Spectrum Kitchen can custom craft solutions to create the perfect kitchen for your uses. Lastly, we reached the home owner’s kitchen storage goal by integrating a tastefully built 30″ pantry and 15″ broom cabinet. Smart design means functionality. When opening up a small kitchen to create a great room we love to shift core kitchen components out from underneath cabinets and into an easy access area. Here, we moved the kitchen sink out onto the open countertop peninsula then arranged the major appliances so that each had ample counter space to their sides. This solution made for an easy to move about kitchen and enjoyable cooking experience. A small kitchen can be transformed into your dream kitchen if you have the creative vision with deep design and installation experience. Small but important customizations can make all the difference in usability, which is why our Semi-custom solutions deliver superior looks and functionality. We are proud and truly happy to present this new kitchen to the homeowner who will enjoy it for years to come.